Just what is a Jitney Bus? (The New York Sun – 1915) A Jitney bus, my children, Is any thing that run on four wheels and gasoline and five cents. The four wheels and gasoline represent the bus part of the equation, and the Jitney Is a quick cut to the twentieth part of a dollar. You pay the Jitney and the bus takes you to your destination. In Russia, jitney means a small coin. 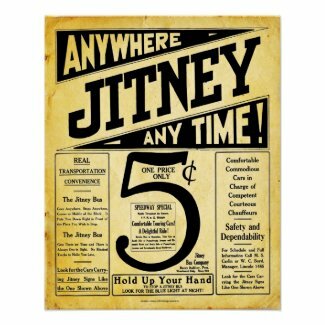 In America jitney was originally a side-show barker’s slang for a nickel, and in some parts of the country it is commonly used in that sense today. But throughout the entire United States it is rapidly taking on a new meaning which might be defined as any ” self-propelled vehicle which hauls passengers for a five-cent fare.” Just now the slogan of the jitney is “take you anywhere and stop at any corner for a jitney. Jitney Bus Service in Washington D.C.
Five Cent Automobile Rides Have Revolutionized Passenger Transportation in the West, Where Idea Originated. Ladies and gentlemen and others who do not depend entirely upon your pedal extremities to transport you from place to place: We have with up to-day the Jitney Bus! The Jitney bus is here to stay. You might as well get acquainted with it now, for sooner or later the familiarity is bound to come. SAN FRANCISCO. Feb. 27. City passenger traffic In every city and town of importance on the Pacific coast is being revolutionized by the advent of the Jitney (five cents) bus. And even the officials of the big street railway corporations admit it has come to stay. When the first Jitney bus operator appeared on the streets of San Francisco prepared to carry passengers for five cents from the Ferry building to Market and Castro streets a distance of three miles, local transportation magnates smiled. “He won’t last a week they said. He’ll starve to death if he sticks to the game of bucking the street railway company.” Today there are 600 Jitney buses operating in San Francisco alone and they are taking thousands of dollars dally from the street car railway company. Traction officials in every city of the state admit the Jitney Bus is making deep inroads on their receipts. Texas Enthusiast Declares Every Eastern City Will Take Up Situation – Before the end of next fall every large city in the United States will have a growing jitney bus service, predicts Douglas V. King, vice president of the Automobile Transit Company, of Fort Worth, Tex., which Is now operating thirty-five jitney buses in that city. Mr. King Is on the Inst lap of an extended trip through the East and South, made with a view to installing a jitney bus service In twenty-five or thirty of the largest of the Southern cities, and will return to Texas the latter part of this week. “The Jitney bus is here to stay. I know of no one who has made a more thorough study of the situation than I, and both my experience and observation confirm that opinion.” said Mr. King. “Gasoline transportation bears the same relation to the street car that the inter-urban line bears to the steam road. And there is no more danger of the jitney bus putting the street car out of business than there is of the interurban lines sending the steam trains to the crap heap. Each has Its place. The illustration below will give yon some idea of what the Elbert Jitney Bus look- like. The first car is being rushed to completion and will he in service within the next few days. Additional cars will he completed a rapidly as men and money can do it. ALTHOUGH a new feature in city transportation, the : ‘jitney bus” has come into such popularity, particularly in cities of the Pacific coast, that it is proving a serious rival to the service of the street-car companies and is furnishing some knotty problems for municipalities themselves. The ”jitney bus” is simply an automobile that carries passengers for five cents. “Jitney” is a slang term of uncertain origin, used for years on the Bowery in ‘New York, and meaning a five cent nickel coin. In Portland, Seattle, Los Angeles, and the cities of San Francisco Bay, there were nearly 3,000 automobiles engaged in this service in January, 1915, with the number constantly increasing, and the minimum daily earnings of these cars aggregated about $19,000. As a result of this competition, the street railways of Los Angel es, are cutting down some of the runs and taking off cars – Now the “jitney bus” has been introduced in Denver, Kansas City,. Mo., and Des Moines, Ia., and is rapidly making its way eastward. With an ever-growing number of Jitney buses scurrying through the streets morning, noon, and night, the question has arisen in nearly very one’s mind, “Is jitneying profitable?” The answer has been hard to find, probably for the reason that the jitney business In Baltimore has not been operative long enough to demonstrate the life of the first cost or the necessary expenditures for wear and tear, damages, and repairs. A casual observer might not imagine that there was any chance of the jitney operator coming out ahead of the game. It is easy to see that in the early morning and late afternoon the jitney men do a rushing business, but at that it is only in one direction. In the morning the machines are packed to their capacity in their trips to the center of the city, but nine out of ten of them return to the outskirts empty. In the evening the reverse is true. Jitneys being loaded down with bread-winners going home from work and the trips into town being profit less. In the middle of the day there Is more or less traveling on the buses, but between these times It appears that the machines are not overtaxed with passengers. And so it went in the old newspapers of the early 1900’s with the jitney bus, specifically in 1915. As a matter of fact, all the articles from above were found in that year. After 1915, most mention of the jitney was either from sales advertising or the occasional crash. As of 2016, it looks like the Jitney bus is making a comeback (well in name anyway) with a creative companys using the name for their buses that run to the Hampton’s. One thing is for certain, the price of 5 cents per trip is certainly a thing of nostalgia. Just read where my grand parents, and children, got off a train at Claremore, Oklahoma in April 1915. A Jitney picked them up at hauled them to a relatives place 3 miles out of town. They got stuck in the mud several times, and had to use a block & tackle to pull the Jitney out. This was about the time they began to be called Jitneys. I REALLY appreciate the history lesson.